Those of us with small bathrooms often feel like we’re drowning in toiletries, cleaning supplies and hair products. De-cluttering your bathroom and creating a space that is functional and easy to maintain is important because in the morning, you deserve a mess-free, stress-free bathroom to get ready for work and the new day. 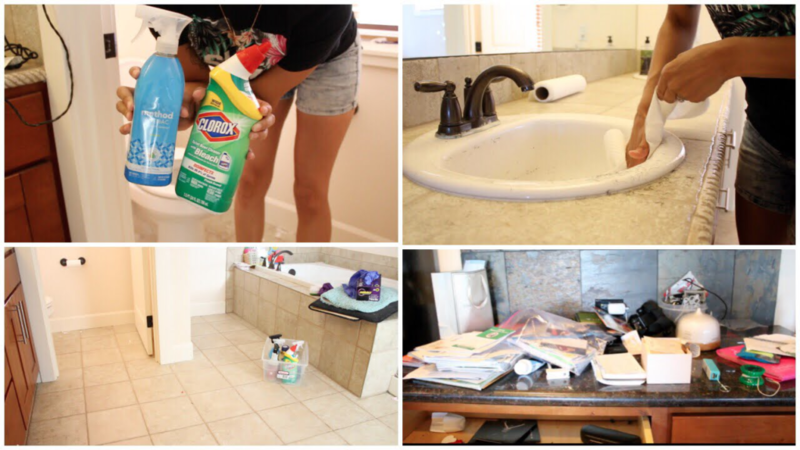 Here are some easy-to-apply bathroom de-cluttering tricks. The trick is to increase the storage options in the bathroom without adding unsightly boxes or wall cabinets that make your space even smaller. Adding storage is the first and most effective step, since no matter how much you purge your essential product list, there are always too many bottles, boxes and tubes. Exploit the under-counter space and add wicker baskets that will make storing and accessing similar items easier. Also, there are a variety of under-sink options, such as hanging cabinet door bags and spice racks. If you like having your cleaning supplies in spray bottles, you can easily hang them on a horizontal bar in the under-sink cabinet. There are also many over-the-door hanging options, but these don’t really hide your clutter, only move it out of the way. Finally, install narrow cabinets with doors in tight spaces where they won’t be an eyesore. How many hair products and make-up items do you actually need to get ready each morning? How many of these you actually use in the shower? If you’re critically low on available space, make sure you only keep those items in the bathroom that you use daily. 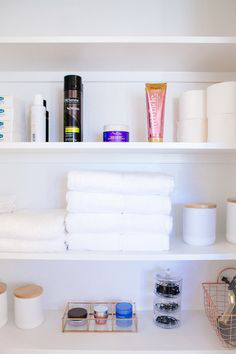 For everything else that you use occasionally, such as special hair products, medicine and grooming items, you can easily find another spot in your home. Trying to find a small item in a cluttered bathroom is like finding, well, a hair pin in a drawer full of bathroom supplies. Small items like tweezers, bobby pins, nail clippers and nail files that we sometimes urgently need in the morning often get stuck behind, in between or just hide in plain sight. Throwing them in a jar is just as impractical as dropping them in a drawer or on a random spot in your medical cabinet shelf. The simple answer is to install magnetic strips to the inside of the medicine cabinet door and simply stick the metal grooming items on the strips for easy, clutter-free reach. In some cases, it’s not the lack of storage that is causing the clutter, but the bad choice of bathroom fixtures and even worse arrangement. Not all types of vanities, shower stands and bathtubs work with every layout. A built-in corner tub might have once seemed as a good idea, but the fact that it cuts your available space in half is just too obvious to ignore. For many small to medium size bathrooms, an elegant freestanding stone bathtub is a much more practical, but also aesthetical solution. These baths are available in a variety of shapes and designs, including those which can be concealed, if the floor structure allows for it. You’ve been selective, picky, even hard on yourself, but the make-up pile doesn’t seem to be dwindling. It’s time for the one in, two out rule. For every new lipstick, eyeliner or crease brush you bring in, two other items need to go. Just bin them or make a present to a friend who is more likely to use the shade that you never wore. The same applies to shampoos, conditioners, body lotions, and all other products that keep multiplying. It’s important to mention here that you also need to get rid of unwanted gifts. While they always come in good intention, perfumes and skin formulas aren’t always to your taste. You’re not obliged to keep them – simply pass them on. With such a simple addition as an inexpensive wooden tray, your unsightly pile of hair products and make-up items easily turns into a carefully compiled collection. While baskets and boxes are great for open shelves, ledges and corners, trays rule the open countertop spaces. If you’re pleased with your new countertop arrangement, you can go one step further and order nice uniformed glass bottles of different sizes, in which you’ll transfer your beauty products for a more boutique hotel look. Speaking of hotels, now it’s the good time to stop hoarding those free hotel toiletries. 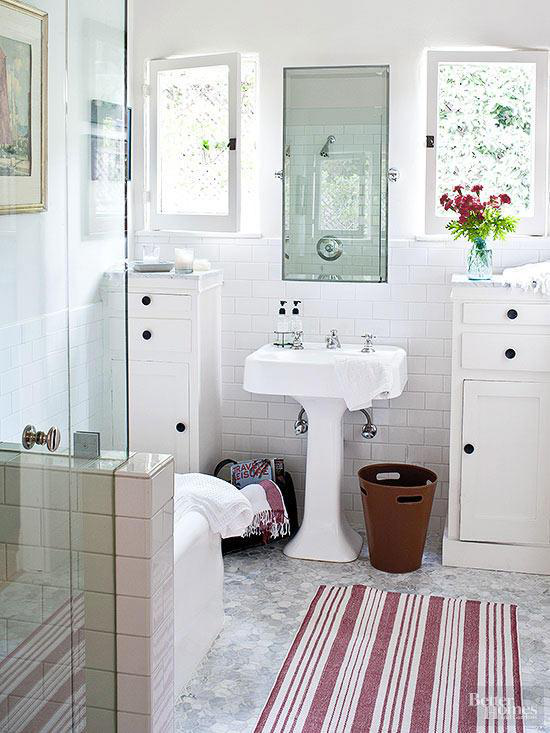 Being probably the smallest room in your home, the bathroom is more likely to get messier than any other space. These six space-saving and de-cluttering tips can turn your crowded bathroom in a perfect place for you to rise and shine every morning.